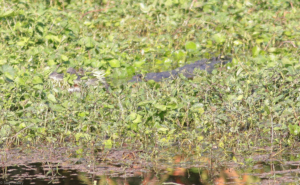 Adilei, REGUA’s resident Bird Guide, was walking the wetlands on his usual patrol when he spotted an unusual Caiman. Peering through his binoculars, he saw that either one of REGUA’s adult Broad-snouted Caiman (Caiman latirostris) had developed far too many bristles or had wrestled with an Orange-spined Hairy Dwarf Porcupine (Sphiggurus villosus). The Caiman’s head and neck was completely covered in quills, resembling a dragon. Adilei could not understand the motive that induced the Caiman to eat such an unappetizing animal and now wonders what will happen to the Caiman! Although it was not easy to get a clear view of the event with the camera, Adilei got this photograph, which shows the quills quite clearly. We are keeping a close eye out for any more sightings! Helmut Seehawer has been visiting REGUA for many years. As a former Lufthansa Airline Pilot, he flew from Germany to Brazil regularly, and in his free time explored the countryside. On one occasion he travelled with his colleagues to Paraty in Rio State. In those days there were no roads and travelling was a real adventure. One of his friends was keen to find orchids and although Helmut could not understand the fascination, he wanted to explore the jungle. He was delighted when they found some unspoilt forests with their huge trees, tangles and epiphytes. The friend pointed out large, bright flowers of orchids on the branches of the trees, and at times the two of them climbed trees to get closer views, occasionally jumping from one tree to the other using the branches and vines. Whilst climbing the trees, Helmut noticed some smaller plants with more delicate flowers, these too were Orchids and a passion was realised. Helmut purchased a “Sitio” or property in the mountains near Nova Friburgo so that he could explore and protect the habitat there, especially the wonderful orchids he had grown to love. 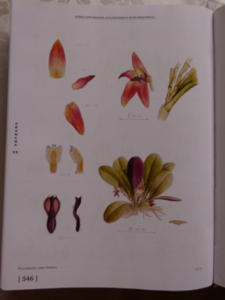 A collaboration with David Miller, Richard Warren and Isabel Moura Miller in the late 1990’s resulted in the acclaimed book ‘Serra Dos Órgãos Sua Historia e Suas Orquideas’ [Serra Dos Órgãos your history and your orchid]’. 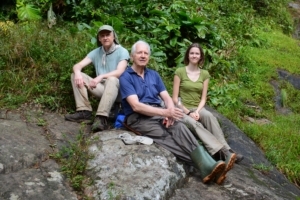 Helmut is back at REGUA for an extended visit with his son Klaus and grand-daughter Katja, who are both carrying on the family love of biology and nature. Klaus is a snake enthusiast and has spent long days in the field looking for snakes, whilst Katja has previously spent time as a Volunteer researcher at REGUA, studying the mammals around the wetland. I am fascinated by snakes. 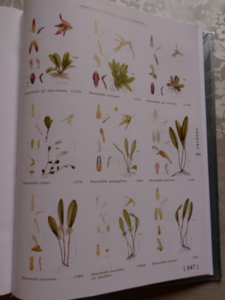 My father, Helmut, is an orchid specialist and he knows of over 680 species of orchids that can be found in the cloud forests of the Serra dos Órgãos mountains in South East Brazil. This is a really important area for biodiversity. Accompanying my father on his trips to the Atlantic forest starting in the late 1970’s we frequently stumbled over different species of snakes without really knowing them. I became interested in what was creeping between our feet. Looking closer, my fascination for these creatures grew and looking even closer I finally fell in love with snakes. Over the time I have specialized on true vipers and pitvipers. 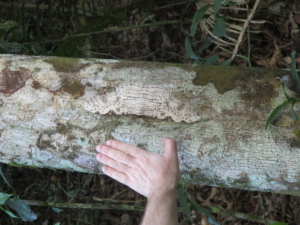 In the past 30 years I studied female Bothrops jararaca and other snakes in upland habit of the Atlantic forest. 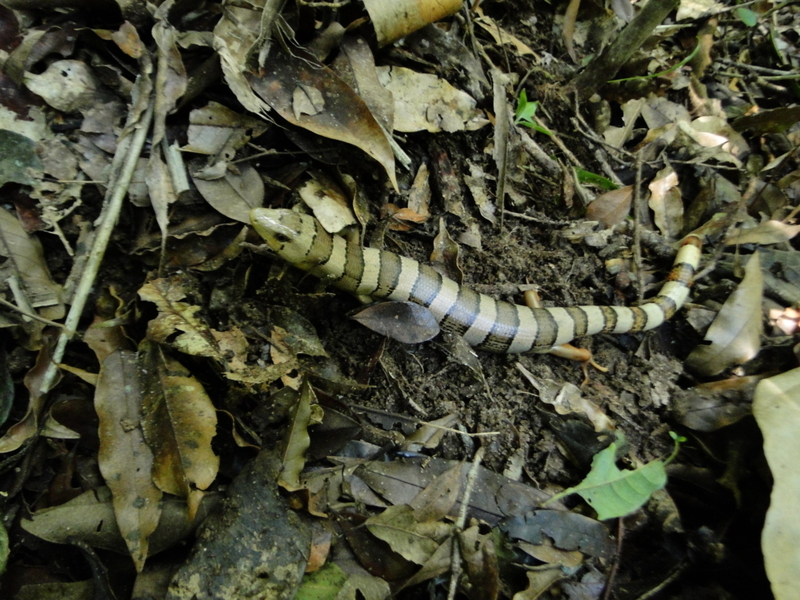 Looking for snakes at REGUA is quite a different story because it is lowland habitat and snakes behave quite differently. 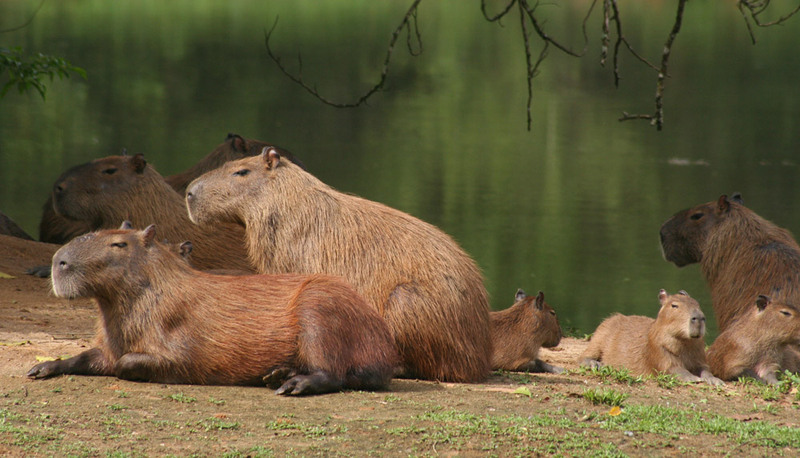 Generally higher temperatures give these poikithermal animals even less reason to expose themselves to the sun. Snakes are well camouflaged, shy and secretive. Especially vipers will hide most of their lives. All this makes snakes very hard to find for the naturalist. However, on 9th of April 2017 I found something very special here at REGUA, a new born Jararacussu (Bothrops jararacussu) on one of its trails. The little snake was only a little over 20 cm long, which is small for this species. Literature gives 26-28 cm for this species but it is not mentioned if this data was taken from captive animals or those in the wild. Breeding of the genus Bothrops takes place between November and March. 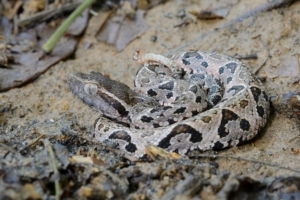 Bothrops are ovoviviparous; Juveniles are born alive or under breaking a transparent egg hull. Up to fifteen young can be born simultaneously. This happens usually at the end of the rainy season. Juvenile snakes are difficult to identify. In this case it had to be determined whether it was a Jararaca or a Jararacussu. 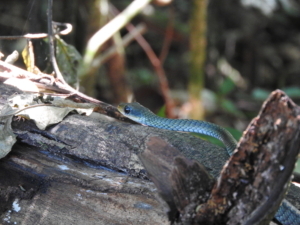 The unicoloured top of the head, the more triangular shaped head, the slightly upturned and sharper edged snout, the more rounded A’s on the snake’s flanks and the little spots along the snake’s spine between the A’s make this snake a Jararacussu. The Jararacussu is a large heavy bodied terrestrial snake. 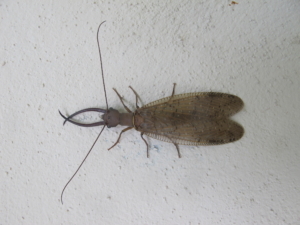 Females longer than two metres are frequently encountered. Males are smaller. Preferred habitat is rocks in close proximity to water. It is often said to live in semiaquatic conditions. 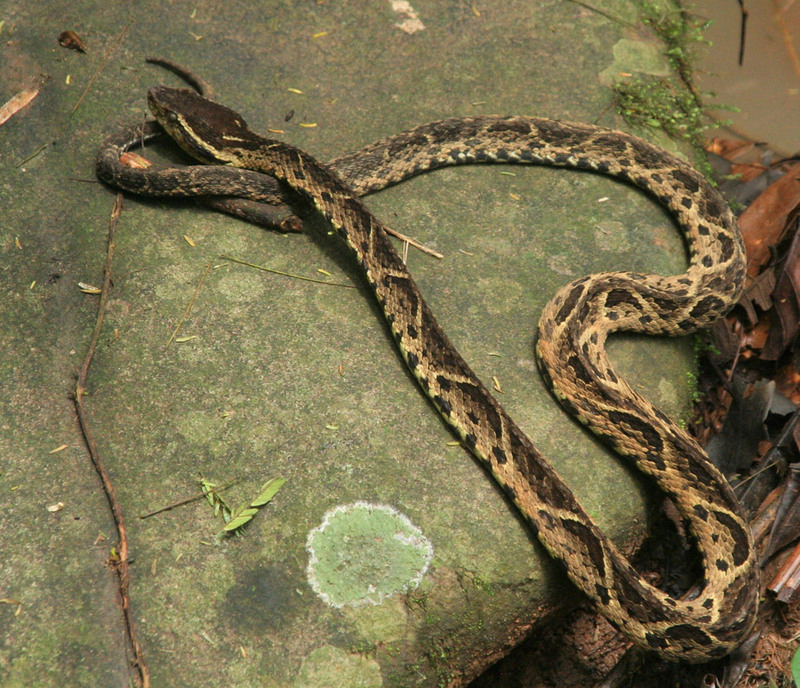 Generally it prefers damper habitat and is by far less abundant than its generalist cousin Jararaca (Bothrops Jararaca). will have when it is a two metre giant. So these scales are only micrometres small and still are individually coloured in grey, brown, black and white or even have a pinkish hue. Did you notice the snake’s pale tail? 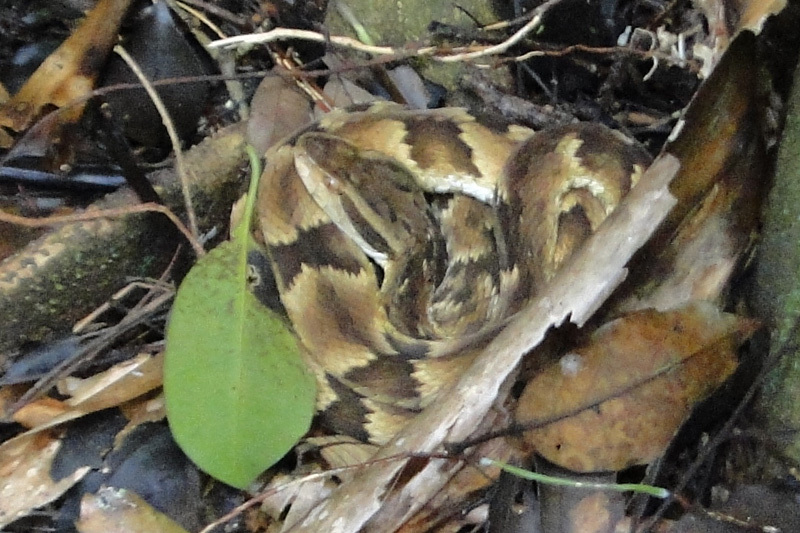 Many Bothrops as juveniles feed on frogs. By waving the tail a worm is imitated and frogs are lured into striking range. Remember Bothrops are born at the end of the rainy season when young frogs are numerous also. Growing up, Bothrops change their food preference to warm blooded rodents. At this stage the tail colour changes to the ground colour or black in this species. The location site of this snake was well off the regular tourist trails. 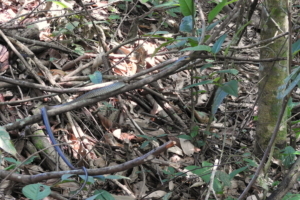 Venomous snakes are very rarely seen on REGUA trails. Still everybody should remember venomous snakes could be encountered everywhere in tropical areas. Snakes will never attack unless seriously cornered or hurt. Give snakes their space and try to enjoy the rare adventure of seeing a snake in the wild, and if you are lucky enough to find one remember to take a good look, get a sketch, photograph or video and as much information as possible to enable an accurate identification.